On that day in 1967 I remember my Dad, one of the Pilots, rushing the family down to our boat. We then went out to join those already viewing Sir Francis Chichester and his world-famous yacht Gipsy Moth. This page was added by Ian Chalklin on 10/11/2008. 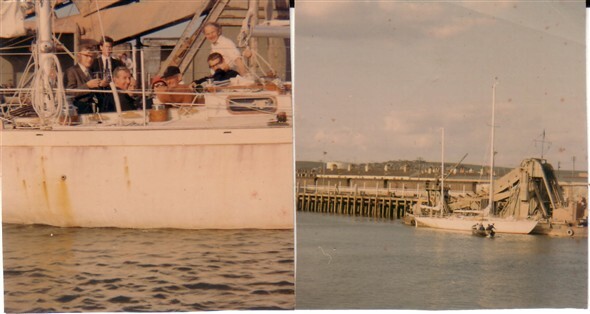 These photos of Gypsy Moth IV show the vessel in Newhaven Harbour, presumably on her way round to the Thames where she became a set display along side the Cutty Sark. Later still (and up until the present) she has been reactivated and used as a Sailing Trust Association craft. During the early 1980's I remember working on Gipsy Moth III which he had used in the Whitbread Trans-Atlantic race. This work was done after he had parted with her and while she was at Brighton Marina. Good picture of the dredger. It was one of the sounds of Newhaven along with the fog horn. Can anybody remember the steam trains blowing their whistles to bring in the New Year? I find it funny that the only berth apparently available for such a high profile yacht and sailor, was alongside the dredger! I wonder what advice Sid gave him! They moved GMIV there so that the boat was away from the quayside itself and therefore had a modicum of privacy, so Sir Francis wouldn't be disturbed during the night. - Andy, Editor. I remember waiting for the bus at the bottom of the town to take me to Plymouth - I saw Gyspy Moth whilst it was there. Funny how times change, my mother put me on the bus and waved goodbye. I remember the sweet smell of the man sitting next to me's pipe which he seemed to smoke for the entire journey. On arrival I was meet from the bus and had a great week. Why do I think times have changed? Because at the time I was only 12 years old ... how many people would let that happen to a 12 year old now and yet at that time it was quite normal. 'Royal Blue' coaches, if I remember correctly. Andy, Editor.